@leafo – yes all fixed now. Hi Tyler, first of all thanks for the feedback. Documentation is something we've been working hard on over the last couple of months. Very soon a full set of Docs will be available on the website, breaking down how every feature works. I will look into getting some specific tutorials added to this page on creating certain sprites e.g. tiles, trees, humanoids etc. We will also be uploading another Introduction Tutorial on YouTube, which includes all the features added in updates since the first video. The demo version was originally restricted to creating 1-bit sprites, however is now fully functional with every feature except export. We also have 15 example grids you can load from the software Welcome Screen to get you started quickly. I have also checked my history, and two buyers from Spain have been charged different amounts. $20 for the one using the widget and $24.20 for the one using the project page. It looks like VAT MOSS is correctly applied when using the buy button on either the project page, or when using the itch.io custom button api. After selecting your payment method it asks for your address, and then adds on the required VAT. When using the itch.io widget, you select the payment method then it skips straight to the email and card details screen or paypal screen with no VAT applied and no address asked for. So at the moment, someone buying from Europe will get my product cheaper if using the widget, as VAT won't be added. @Moblyn Thanks for the detailed input on this. Animation is the most requested feature and something I hope to get implemented further down the line, maybe version 1.5. I have looked into several different ways I could implement it, and will hopefully do some testing soon and get a plan in place for development. Reference having a pixel editor built into the software, its very unlikely this will happen. I have always seen this software being used in addition to other great pixel editors such as Aseprite and Pyxel Edit. 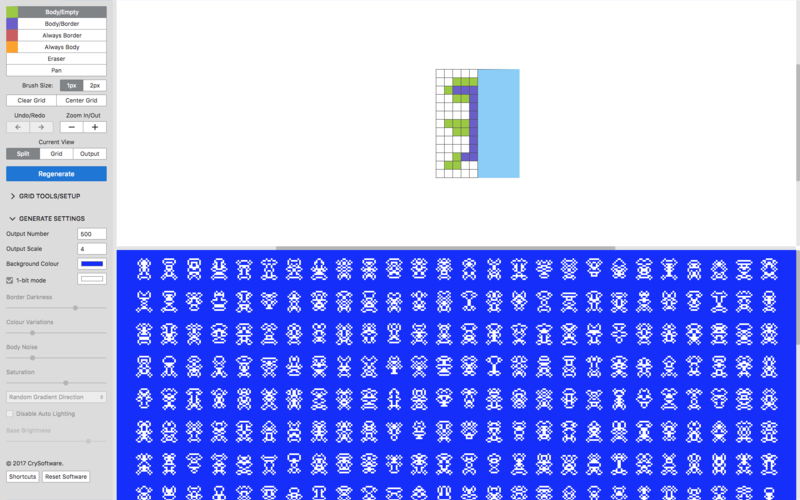 However, procedurally generating animated sprites is very much on the radar for future versions. itch.io Community » General » General Discussion · Created a new topic #notatgdc - long way from the UK, but hopefully one year. Hello all, my names Tom and i'm the developer behind CryPixels Procedural Sprite Generator. Thought I would take the time to thank @leafo for all the incredible work constantly improving and refining the itch.io platform. From someone new to indie development it has been an absolute dream to work with and I will always make sure anything I release stays on itch.io so people can download it DRM free. On a side note, if anyone has a YouTube channel or website and they would like a free copy of CryPixels to review just drop me a line. CryPixels community » Showcase · Created a new topic Stormtroopers! Thought i'd get things started with some stormtroopers I knocked up after watching TLJ. If anyone wants the .crypix grid let me know and i'll fire it over. CryPixels community » General · Posted in Feedback from a non-customer. Hello Sharm, first of all thanks for the feedback, I take it all into consideration whether positive or negative. 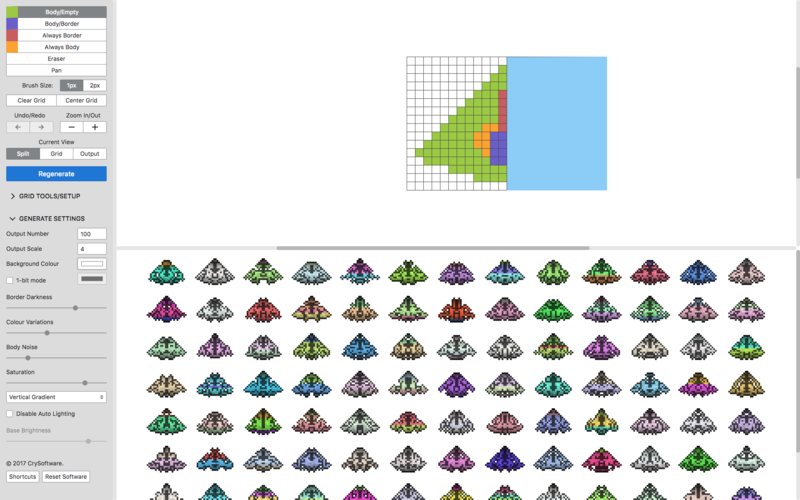 I believe all the screenshots on the product page have perfectly usable results, bare in mind not every single sprite generated is going to be right, it's designed to generate a couple hundred over and over again until you find the right one. I fully appreciate that a pixel artist is going to rather do this work by hand, and it may well be a useful tool just using the 1-bit mode to generate ideas and rough mockups and then take into a different program for detailing, and if I was a pixel artist that's probably exactly what I would do and yes $20 would sound a lot. However I feel for game programmers wanting quick art you can get very good results which can always be touched up at a later stage. I'm currently working on implementing a lot of the extra options you speak of, and hopefully this will give someone who requires a finer control on the outputted pixel art style what they're looking for. In regards to selecting a specific Hue this is in the next version. I want to make this software the best it can be for non-artists to be able to develop decent art for their games. I believe the price is fair, and will enable me to spend enough time in the future developing this product so it can reach it's potential. The 1-bit mode isn't really designed to be a limitation for a demo, but more a fully functional version for people who want that style of art. Or for pixel artists who want to generate ideas for a basic sprite to start with before moving into different software for colouring/detailing. If pixel artists want to use the software, this is probably how they'll use it, in which case I wouldn't say the price is over the top as the price is free. Adding an additional body colour to the 1-bit mode is a great idea, i'll look into that! 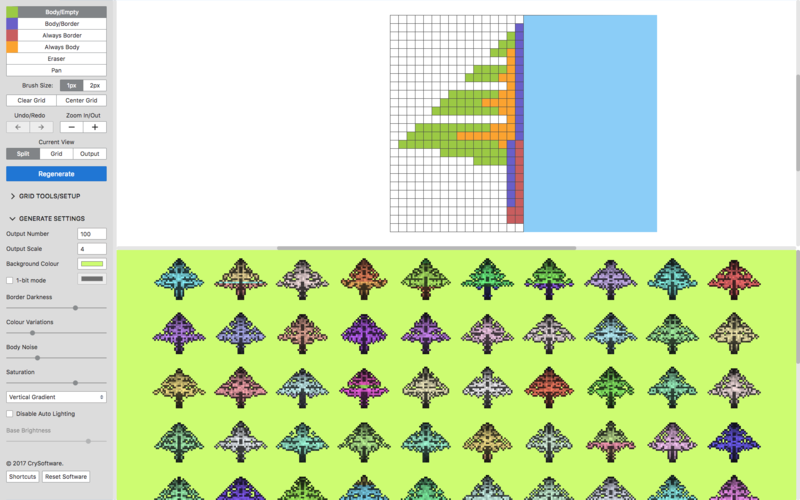 Explaining how the procedural generation works isn't ideal, and hopefully i'll come up with a better way to explain the different brush options used in the grids more clearly! That video is designed more as a temporary fix while further documentation is made. 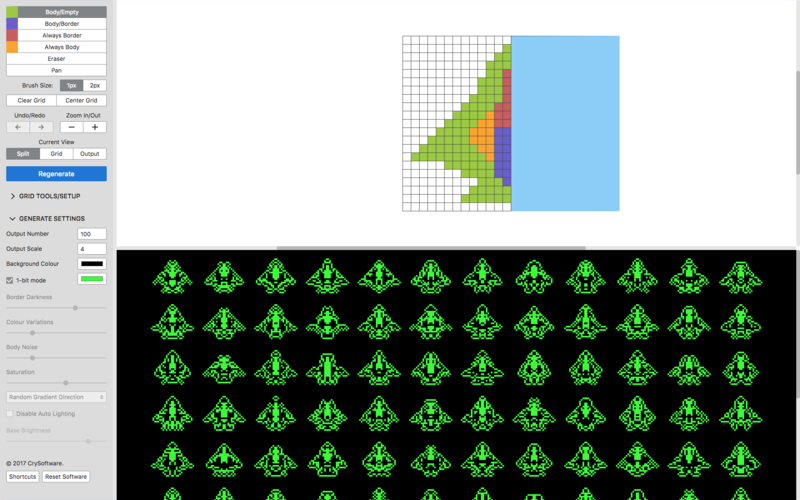 I believe however the video along with the example-grids download should get most people up and running quite smoothly. Thanks again for the clear & concise feedback, it's always appreciated. Have released a FREE version of the recently released CryPixels Pro software. Free version is limited to 1-bit mode, but otherwise fully functional! 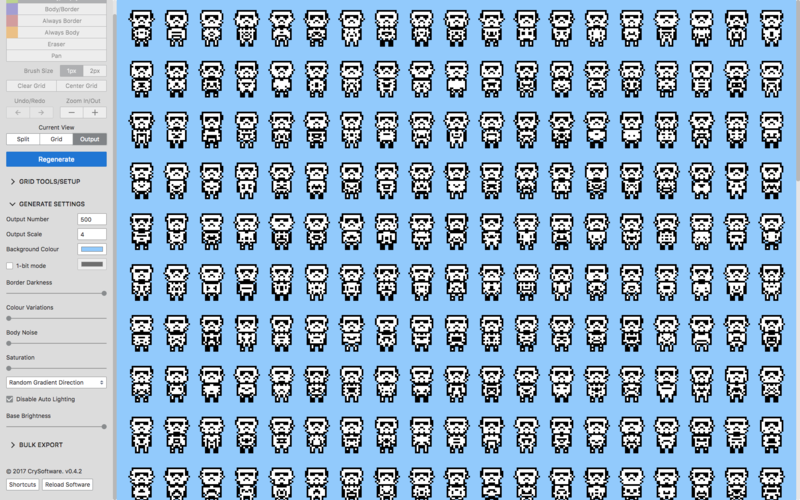 Examples of generated 1-bit sprites below, hope you enjoy. Introduction Tutorial now on YouTube. Design endless amounts of sprites using CryPixels procedural pixel art generator with easy to use GUI editor.